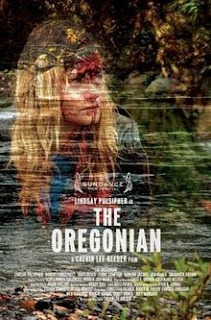 A young woman (Lindsay Pulsipher) finds herself covered in blood in a car with bodies around her and no memory of who she is or what happened in THE OREGONIAN. In the middle of nowhere, she sets off looking for help and for answers and instead finds herself caught in a nightmare of strange characters and stranger situations. Of course for the audience, the answer as to what’s really going on is fairly obvious almost from the get-go, so we’re really just watching our protagonist put the pieces together. Whether that’s worth watching largely depends on your tolerance for surrealistic set pieces in a film that feels like a talented but rough around the edges David Lynch fan remaking CARNIVAL OF SOULS. In all honesty, it’s debatable whether this truly qualifies as a horror film, but I found it in the horror section on Fandor, it’s rife with gory and/or horrific imagery, and since I watched the whole thing and only have so much time in the month, it’s getting included in my 31 Days of Halloween marathon for this year. And let’s face it, aside from the hardiest of arthouse aficionados, horror fans are pretty much the only ones willing to watch a movie in which characters nonchalantly pee blood and vomit up black goo while laughing, to name just two of the gruesome sights on display. I like the overall feel of the film (and I’m fairly certain it is shot on actual film, given the satisfyingly grainy look of the thing), and writer/director Calvin Lee Reeder comes up with some compelling imagery. Does it add up to much? I’m not really sure. The themes of having to come to terms with one’s past before moving on seem fairly obvious, but of course I could be missing something deeper. At any rate, while the film started to lose some of its appeal for me the further along it went, it ultimately didn’t go on long enough to lose me completely. Those who are fans of surreal cinema should probably check it out. Those looking for more straight forward fare need not applay. 2 ½ out of 4 stars.